I made tofu from scratch this morning, and surprisingly, it wasn't time consuming and it didn't make too much of a mess. But the soymilk I made yesterday to make the tofu today? Well, that's another story. I followed their instructions, using metric weights for a 1 quart yield of soymilk, but even when straining through a very fine nut milk bag, I couldn't get the yield until I boiled more water and re-blended my mixture. Then, the texture and thickness of the soymilk was more like commercially available soymilk, and also was exactly the 1 quart yield I was after. As one other recipe source I read said, "You can not over-strain your soymilk". I wore kitchen gloves, and pressed persistently. I could have cheated and just purchased some soymilk, but after reading so many vegan recipe websites for making my own, I realized that there is an awful lot of stuff in prepared soymilk. The only things in homemade soymilk is soybeans and water, and it seemed fairly painless, so I decided without much debate I would make my own. What I didn't count on was a bit of a mess, and a whole lot of manual pressing to get the soymilk to a thin consistency. I soaked my whole, organic soybeans for 8 or 10 hours yesterday during the day. 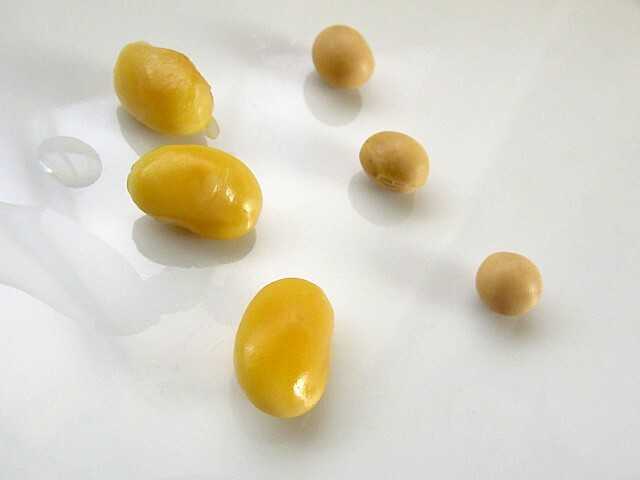 They turned from tiny, round pellets into golden yellow, familiarly bean-shaped things. Then, I steamed them for 20 minutes, until they were tender and didn't taste too beany. One tip? When steaming soybeans or boiling soymilk do not turn your back on the pot. It will boil over, and it will make a mess everywhere causing you to wonder why you didn't just buy a half gallon of soymilk and be done with it. The transformation from soymilk to bean curd was then no trouble at all. Not too long ago, a friend and I split a package of Nigari flakes, a tofu coagulant, purchased from Cultures for Health. (The pound package makes 200lbs of tofu, so we'll have plenty to practice with!) When she gave me my portion in a glass jar, it looked and sounded like sea glass, a dreamy clinking that smelled vaguely of the sea itself. The directions for tofu making call to dissolve 1 teaspoon of the nigari flakes into 1 cup of warm water to culture 2 quarts of soymilk that has been boiled for 5 minutes, then cooled to around 165 degrees. My precious yield of soymilk was only 1 quart, so I halved that. 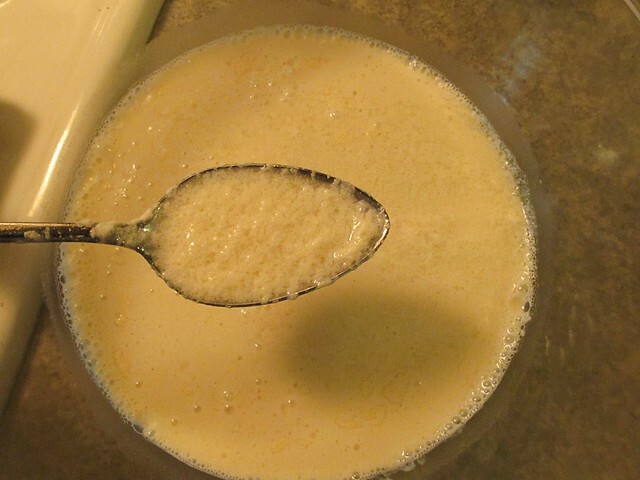 I was expecting large curds to separate from the soy "whey", the way that dairy curds do, but they were very small, a curdled look that I hoped would work when it came time to press it. I let it sit for 25 minutes as recommended, then poured it into my makeshift press of pint-sized, plactic berry containers, one lined with several layers of cheesecloth and the other used as the press with a heavy cutting board perched on top of it. I had to pour the coagulated milk into my mold in several additions, letting some of the liquid drain off so that it would fit. Ideally, a mold/press set up that was this size, but maybe twice as high would work better. 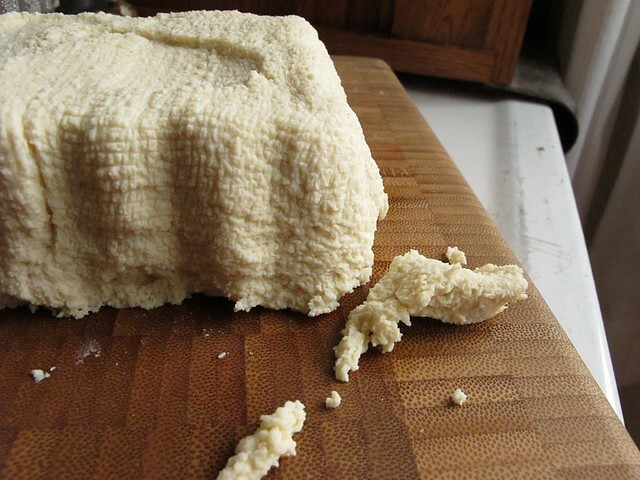 I only let the curds press for 30 minutes, and had a nice, semi-firm mass of beautiful tasting tofu. I nibbled a few bites, wondering what to turn it into that would be worthy of a day's worth of experimentation. I still haven't decided, so I packed it into a glass bowl, covered it with water and added a pinch of sea salt to see if it would help it to "cure" a little bit when I am pondering. My quart of soymilk made 300 g. (10 oz.) of fresh, finished tofu. I've been kind of into making alternative milks lately - and for no specific reason. I really love almond milk, and made some a week ago that I thoroughly enjoyed every drop of. I drank it neat, out of small glasses and savored it. I tried out a peculiar rice milk recipe that had me boiling rice for several hours. I was left with a thick, viscous liquid that was maybe a little strange, but I'm still enjoying it blended with ice and extra cinnamon like some strange horchata, or including it in smoothies to use it up. 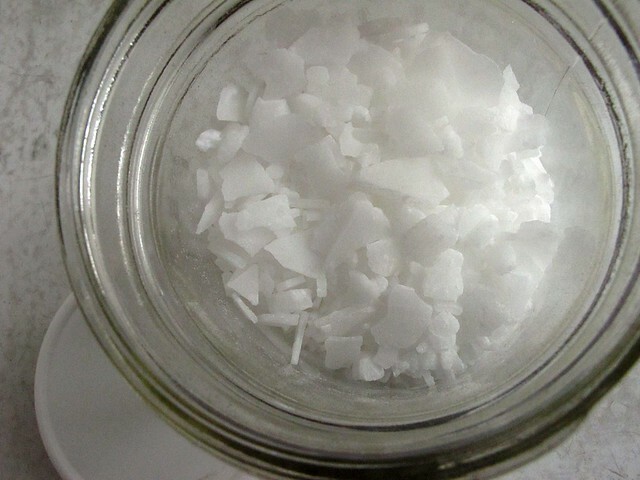 A cup of rice gave me close to a gallon of rice milk when I was finished diluting. There is no denying that it is economical, but come to think of it, I made quite a mess with that project too. Soymilk is definitely more labor intensive than other nutmilks, but I really love the result so I will likely be making it again. 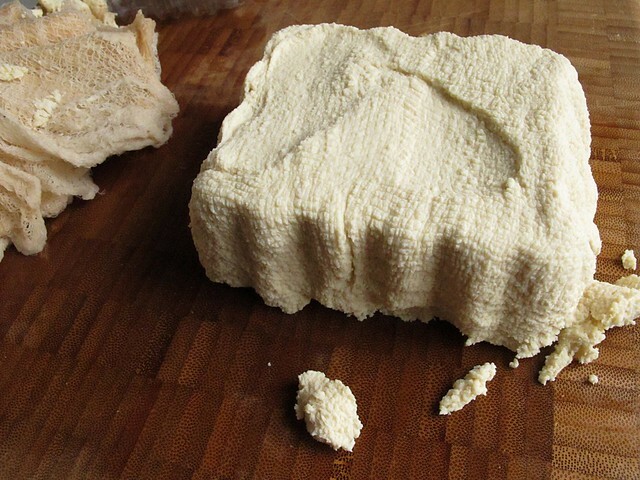 As for the tofu - that is so simple, it practically makes itself. All you need is the culture, and a small measure of patience. The finished tofu can also be cultured further into tempeh, if left for more time at a constant 88 degrees for a day or two - maybe I'll try that sometime in the future as well.